The first thing we learned after creating the world's largest GPS story atlas was a painful pill to swallow. Users do not like to regularly use maps or GPS. Map scrolling and GPS are still too tedious to use by the minute/second. 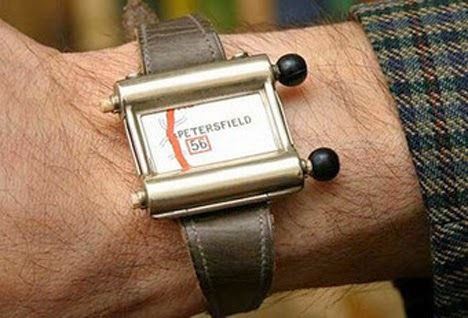 They are made for incidental needs of drivers or walkers - not exactly for the speed of media browsing. 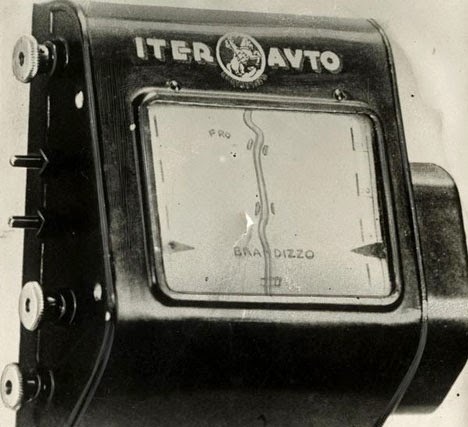 Today map scrolling is not much faster than 1927. 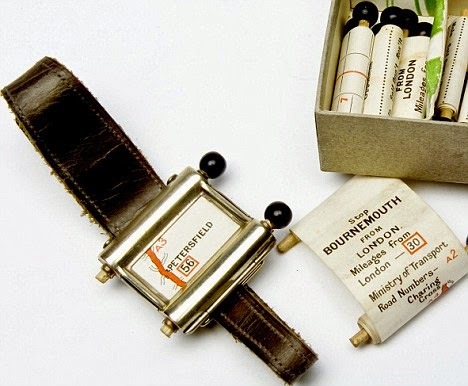 GPS and maps today are still primarily designed for one-off look ups. Fixed map graphics are also visually familiar (on purpose). Not exactly thrilling new stuff to see. For GPS, information "nearby" is almost always fixed (stagnant). People mostly use maps or GPS contextual to activities that need them, and only sparingly for reference..."because they have to" (not often because they want to). In an era, where by-the-second notifications and speed are primary for any successful app, maps and GPS are doomed to fail in their current form. reload the map if car changed routes or turned. Maps consume too much time without offering a return on a goal. 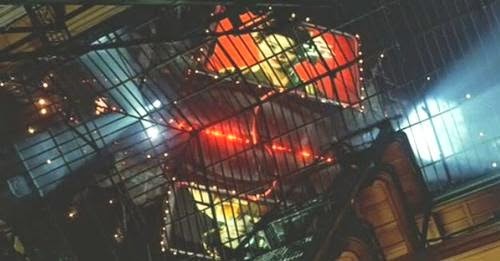 Millions of viewers did, however, find location identification fascinating for intriguing photos and movie scenes whose locations had mystique. They liked location IDs being featured with interesting visuals instead of maps. 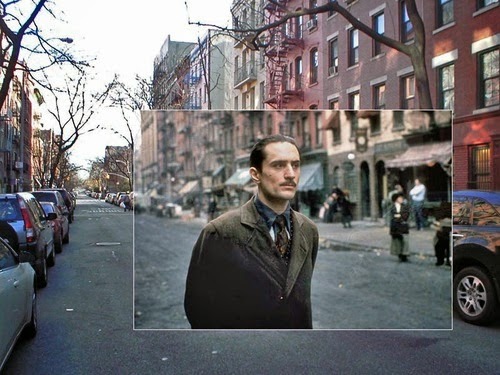 Robert De Niro in Godfather II (1974) between Ave A and Ave B on East 6th St in New York City near your hangout at Sidewalk Cafe. 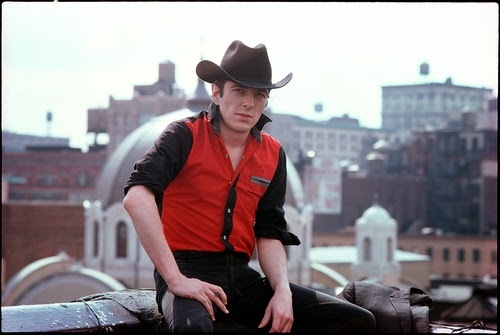 Red building above his head is 524 E 6th St.
Joe Strummer of the Clash was photographed by Roberta Bayley by St George Ukranian Catholic Church (30 E 7th St, NY) which you photographed. Story recommendations for parallel photo activities and check-ins proved interesting in comment threads. Viewers wanted story recommendations contextual to their interests and activities - contextual to their posts. There was also surprisingly a very passionate geo-sleuthing community identifying addresses of iconic imagery and movie scenes who are like daily crossword puzzle experts. They are creating an emerging new genre of geo-curation. People in comments share facts, addresses, personal stories and imagery related to a location. 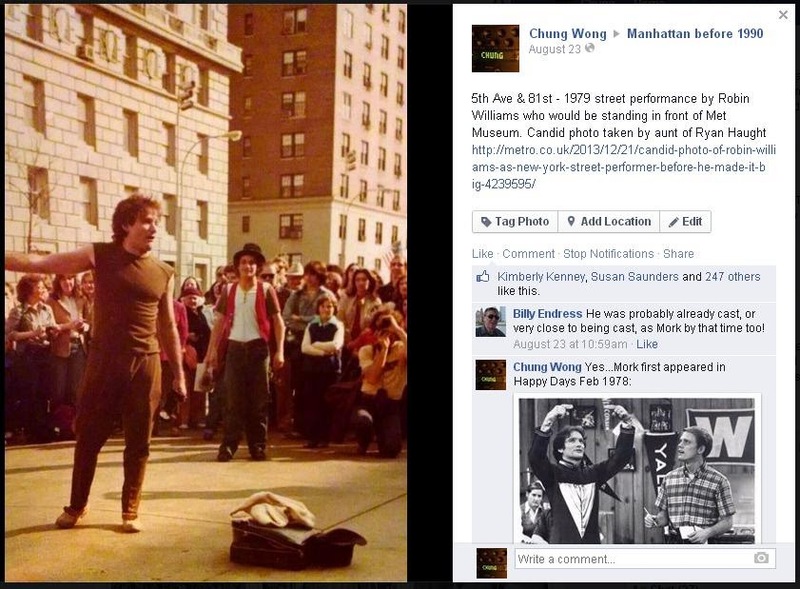 Marc Weiner was identified as the mime with Robin Williams above by the Metropolitan Museum of Art in New York City. Geo-tags map where creative heat in history happened. Most images taken in history are notable. Most stories addressed in history are notable. A "geo-tag" can be seen as a highlighter for notable moments. 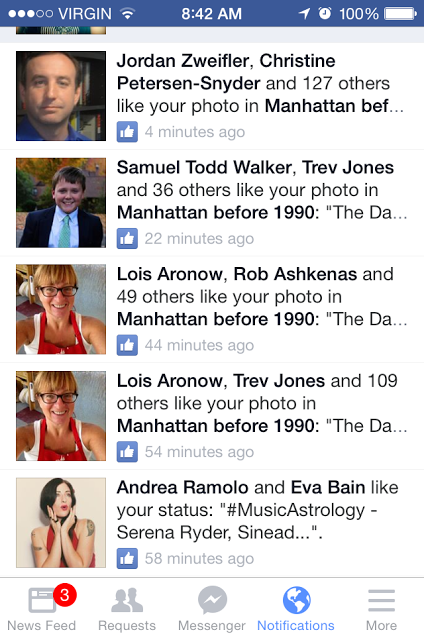 There can be hundreds of notifications for a great geo-tagged post of the day. The only problem is...maps do not allow for threads or notifications, which are the most used functions on the internet. Notifications and threads almost seem essential for traditional crisis mapping to get updates. 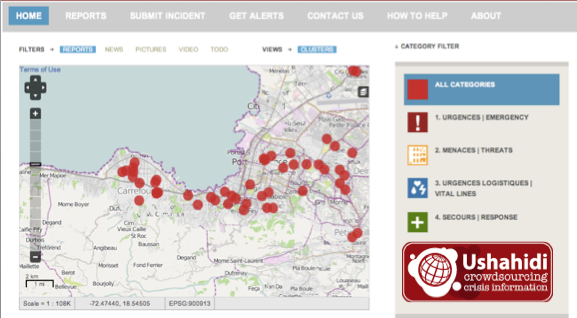 Crisis map 24 hours after Haiti earthquake used to save lives. 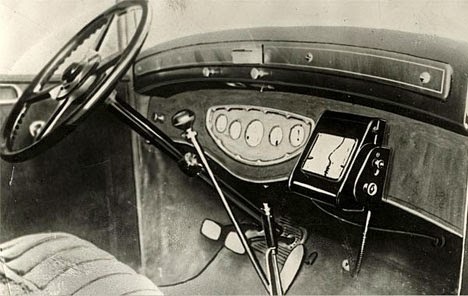 Maps and GPS are set up more for drivers going from A to B instead of conveying geo-spatial information live. Maps do not accommodate narratives (threads) and vast community dialogue. In the narrative space, users need a much quicker way to "jump to" the next point of interest and explore related stories and places. The feedback we got is users want a new kind of map illustrated with notable media as opposed to stock graphics, places and roads illustrated. A navigation system and visual presentation are needed enable speed and fresh content for a user's taste. Recommended content triggers are needed based on a user's tastes and activities. Threads for a pin (and a "like" pin button) are needed to activate geo-notifications. Notifications today are the key driver of media browsing. The mapping industry, however, is primarily focused on how to improve maps and their aesthetics. The industry is missing the boat on how to improve geo-spatial browsing. Maps were not originally suited for media browsing. It follows that any improvement made to a map will still stay within the boundaries of a map. It's hard to imagine how so much earth scrolling will be viable for rapid media browsing. The scrolling through vast useless or random places first doesn't work well for an app and an impatient user on the go. In media browsing, navigation requires "jumping" to enable an instant way to get from one point of interest to another to allow for speedy exploration and discovery. Today rich storytelling is only skimmed at best using a map. When one location like Madison Square Garden has 1000s of stories, only one story is shown on a map. Random pin displays also increase odds of users leaving a map due to a lack of interest. I find this neighborhood in Greenwich Villlage extremely interesting, but have no idea which pin is interesting or what any pin represents. I am lost as a browser. The headliners for you are not so clear. 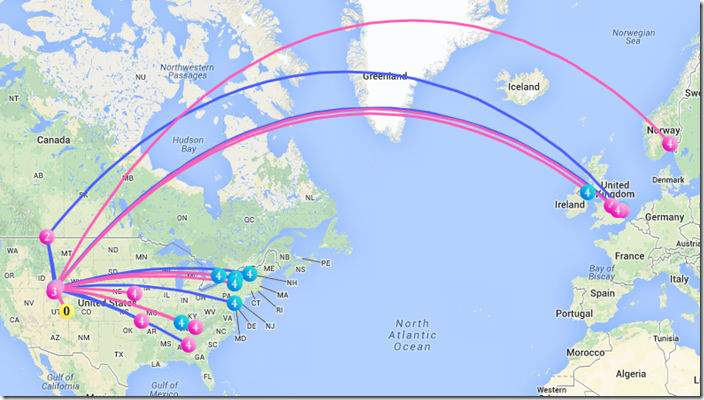 There is very little sorting in a map of stories. Some developers are experimenting with geo-portals that allow you to jump from one related point of interest to another at warp speed to another part of the world. This is a step in the right direction. A narrative exploration needs to geographically skip places in between which have no relevance in a story arc. Related locations in a narrative need to be stitched together for jumping around. And it is key to recommend a narrative of interest for a viewer. Any app is competing against Instagram for viewer attention..anything slower will not do as Facebook (mobile) found out. In Instagram, one scrolls from one point of interest to another rapidly in a feed. Intersecting with someone you know, something you follow, some place related to your past, something you find interesting or someone who shares an interest drives notifications. It's about connections at a place, not maps.